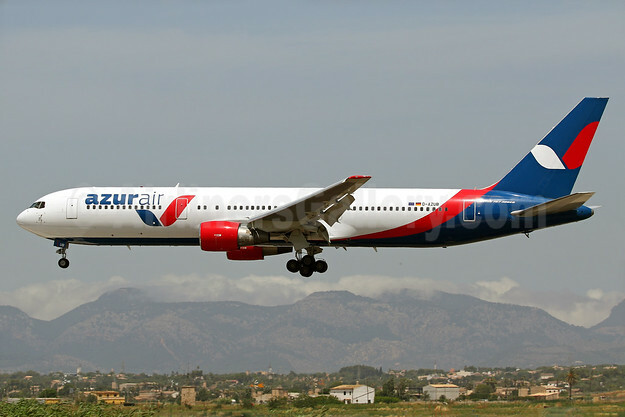 Azurair GmbH, trading as Azur Air Germany (Dusseldorf), is a new German charter airline. The airline is owned by tour operator Anex Tourism Group. The new airline received its AOC on June 30, 2017. Operations commenced on July 4, 2017 with a flight from the DUS base to Palma de Mallorca with the pictured Boeing 767-33A ER D-AZUB (msn 28043, ex VQ-BUP). Copyright Photo: Azur Air (Germany) Boeing 767-33A D-AZUB (msn 28043) PMI (Javier Rodriguez). Image: 938494. This entry was posted in Azur Air (Germany) and tagged Azur Air (Germany), Boeing 767-33A, D-AZUB, msn 28043, PMI on July 6, 2017 by Bruce Drum.